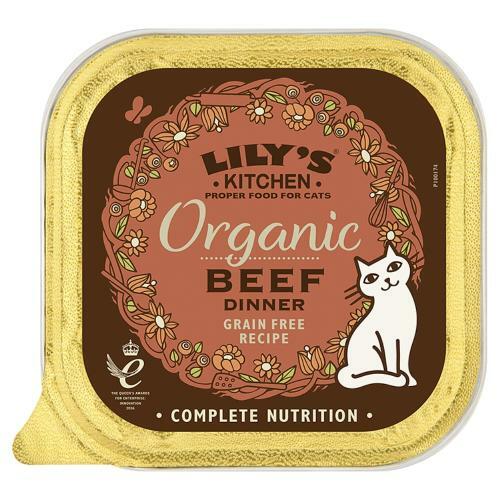 Lily's Kitchen Organic Beef Dinner is a delicious complete food that any cat would love to get their paws onto! Made with 100% certified organic ingredients, Lily's Kitchen Organic Beef Dinner is an especially yummy mix of 56.5% organic, free range beef, chicken and pork with a rustic, chunky pate texture. Cats adore a variety of tastes in their food, so this recipe will keep your cat coming back for more! All that fantastic quality organic meaty greatness means this dish is full of nutrition. Complete and balanced, it includes essential Taurine for eye and heart health, vitamins and chelated minerals for all round health and Omega 3 and 6 to encourage healthy skin and fur.